This latest cold spell led me on a mission to find the perfect sleeping bag for my baby and I’ve found a new favourite! Merino Kids sleeping bags – seriously check them out. Now, I don’t know if it’s a fluke as things with babies can be BUT my little boy started waking just once a night instead of two or three times. That in itself makes me a much happier mum – A stint of 7 hours straight – LUXURY! I don’t want to jinx it, but its been 3 weeks of sleeping from 7pm with one wake up at 4.30 before getting up at 6.30. If you got a sleeper I get that’s probably not that appealing, but in our house it’s like Christmas after a year of 3 or more wake ups every night! Less cold runs through the house and more sleep is good for everyone! It regulates temperature because it breathes, so it controls if my baby is hot and sweaty. It’s soft – it feels quite luxurious rugging my baby up for bed now. I’ve used a bunch of other polyester and cotton sleeping bags, but this one makes me want to cuddle that little bit longer because he is so snuggly! Here’s a video that can explain the benefits of Merino much better than I can. Take a look at why Merino wool claims to be best for your baby? This video shows you it’s because of Merino wool’s unique thermo regulation, softness and easy care properties. 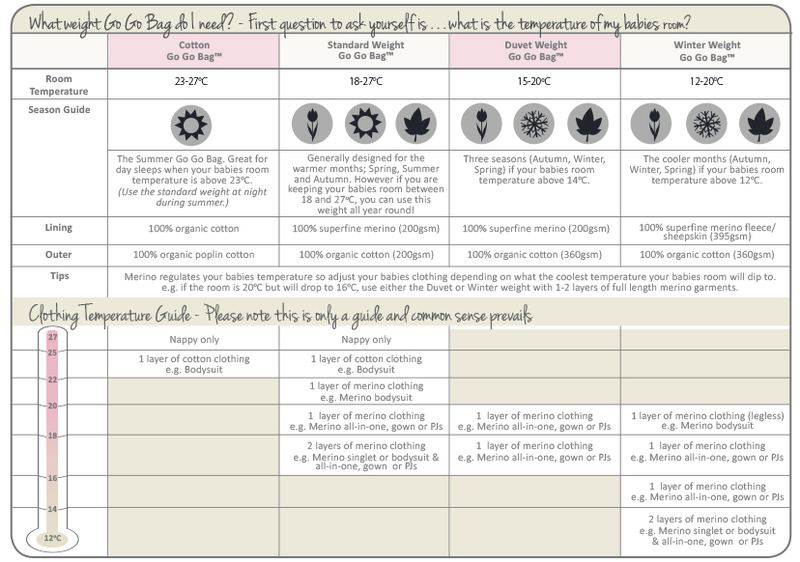 I found this to be a handy chart on how to best dress my baby for bed on the Merino Kids website, I don’t have lots of merino yet – although have it on my wishlist! I’m dressing my baby in a long sleeve body suit and a cotton onsie. On the really cold nights I’m popping a blanket on as well and he really is sleeping so much better. Poor thing – I hate to think he was probably waking up cold! A few other things I love about these sleeping bags – they have poppers under the arms, so if your baby is little you can make sure it fits right and your baby won’t fall into the bag. There is also a pouch so you can use the sleeping bag safely in your pram or carseat. I’ve since ordered a standard weight sleeping bag as well for when it warms up a little bit (it was on sale!) Like the heavier Duvet weight, it’s so soft and gorgeous. I picked the Turtledove which is a lovely soft grey. With a couple of muslin ones from last year, I’m feeling confident I’ve finally found some bedding that works for us! If you’re interested in better Understanding your babies Sleep take a look through the merino kids website, there are some great articles that are worth a read. Ok that’s the end of my raving love affair of my latest baby purchase! Have you got a merino sleeping bag? What do you think? Would you recommend them to other mums?